At least 70 percent of America's over 30 million elementary school students use computers, according to a recent New York Times article. As a result of this increased usage, doctors of chiropractic are treating more young patients suffering from the effects of working at computer stations that are either designed for adults or poorly designed for children. Many children are already suffering from repetitive motion injuries (RMI) such as carpal tunnel syndrome and chronic pain in the hands, back, neck and shoulders. 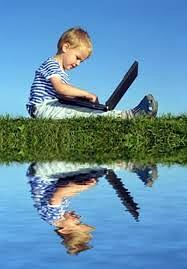 In the present world of computers, child ergonomics is basic thing to be thought to child. Kids must pay attention to child ergonomics because they usually are working on equipment that is too big for them. Children who use computers and other technology poorly can end up with eye strain, carpal tunnel and back problems. No matter how old a child is, preventing computer-related disorders is much easier than treating them after they strike. You can design children's computer work areas with ergonomics in mind and teach kids good habits that will stick with them. Providing schoolchildren with adjustable ergonomic furniture not only helps avoid long-term damage to young bones, but also teaches them to take an interest in their occupational health as future adult workers. Although computers are now commonplace in classrooms that accommodate children as young as four, little consideration had so far been given to the effects of workstation design in the classroom. For this reason schools should adopt child ergonomics policies that minimize the risk of physical damage from computers. Children's use of the computer has increased tremendously. To meet the requirements of young users, manufacturers are re-designing ergonomics computer desks. The main requirement of a child's computer desk is the lower height. It should also be comfortable for the child to work on. 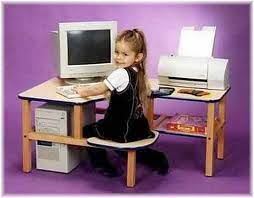 The main aspect in designing special computer desks for children is child ergonomics. Monitors should be at eye-level to reduce neck and eye strain. The keyboard and mouse should also be placed at the ideal height to make it more comfortable. "If your child continues to complain of pain and strain from sitting at a computer, see a doctor of chiropractic," urges Dr. Bautch. "A chiropractor can help alleviate your child's pain and help prevent further injury".